Dutch post has released a unique stamp. It shows the lighthouse of Breskens. But what makes is special is, that it is printed with a glow in the dark effect. Both beams are printed with an ink that absorbs light and glows up in the dark. 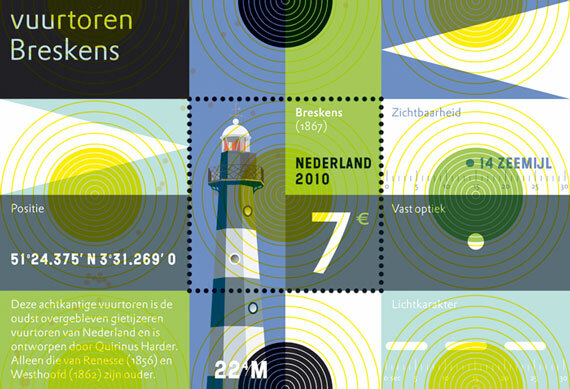 The Dutch coastline with the locations of all Dutch lighthouses was also supposed to glow on the original design, but the dots pointing the locations are too small so the glowing does not work. That's why the choice was made to print the beams in the glow in the dark ink. Because of the high cost of production, it's an expensive stamp, with a value of 7 euros, especially meant for registered letters.